Erling is my husband’s uncle, a friend, and true ambassador to skiing – a kind, athletic, energetic man who will be greatly missed. He passed away in Rutland Vermont this September surrounded by his family in his 98th year. Erling leaves behind a mountain of alpine accomplishments. Born in Pittsfield Mass., Erling learned to ski in his parent’s native Norway at age 5, and continued carving turns into his 95th year at Pico and Killington, preferring Pico but complementing his season at neighboring Killington before and after Pico’s lifts closed each season. Though he objected to war, Erling served in the 10th Mountain Division during World War II, and received a Purple Heart and a Bronze Star for his valiant service in the Italian Apennine Mountains. Erling taught skiing, rock climbing and mountaineering to the troops at Camp Hale, Colorado. After the war, he became a certified professional ski instructor and taught skiing at Dartmouth. If you didn’t have the joy of skiing with Erling at Dartmouth, Pico or Killington, then perhaps you saw him during his six decades of spring ski trips to Tuckerman’s Ravine on Mount Washington, where he would pitch a tent at “HoJos” for more than a month to ski Tucks. 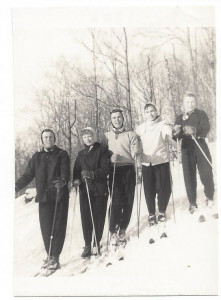 In 1955 Erling married Connie, Carolyn Burke, and together they raised three skiers. Erling started his children in a ski backpack at age one, on snow in the backyard at two, and on the slopes at Pico by three. Kevin, Mari and Kristian raced at Pico, and competed on ski teams at Dartmouth and Williams colleges. Surely one of his proudest moments was watching Mari ski in the 1987 World Cup at Waterville Valley. Kevin and Kristian, whom Erling affectionately called K1 and K2, now have skiing children, so Erling proudly witnessed his grandchildren skiing before his passing. Erling Omland shared his passion for skiing not only with his family and friends, but also to a readership in Rutland and beyond, documenting ski history and happenings in newsletters and columns like “Leaves from a Skiers’ Journal” printed in the Mountain Times for three decades. Erling was a contributing editor to Norway Times and Skiing Heritage, and published author of “Hill Echoes” – his novel of Norwegian and WWII experiences. A particular highlight in his writing career was Tom Brokaw’s reading of his poem honoring the fallen members of the 10th during the 2002 Winter Olympics in Park City Utah. In 2003, Erling Omland was inducted into the Vermont Ski Hall of Fame. Erling Omland’s celebration of life is appropriately being held at the base of Pico’s ski slopes Saturday Sept 27 in the new Andrea Mead Lawrence Lodge (named for the Olympic ski racer) which now serves as home to Vermont Adaptive Ski and Sports and the Pico Ski Education Foundation that Erling help start. I will long remember riding the Pico Quad with Erling, listening to his happy ski songs, or loading first gondola at Killington on a cold morning made warm with Erling’s smile and enthusiasm for “another great ski day.” Following Erling down Killington’s East Fall, reading his countless ski columns and hearing his songs and stories at après ski – where he might enjoy a good ole Schlitz beer, these are Erling’s echoes forever left on our mountains and in our memories.